Attending a class by Noguchi sensei is always a good moment. To me it is similar in many ways in having a very nice dinner at a grand restaurant in Paris. His taijutsu is full of flavors, very refined, elegant and classy; and I always feel sad when it is over. I am a student like any other and sometimes, even in Japan, I don’t feel like going to training. I do it but sometimes reluctantly. But when his class begins, suddenly you feel happy as his joy is visible. After the class you feel more rested than before. His Bujinkan interpretation expresses itself through feeling, and the class tonight was deep, innovative and will change (again) my understanding of Budô. But if you have already attended one of his classes, you know exactly what I mean. Tonight a TV crew was there and that added some rhythm to a class that usually is not missing it. In 90 minutes, Noguchi sensei creates a world of possibility and an infinite number of variations. He doesn’t do a technique, He is the technique. We covered some of the Takagi Yôshin ryû techniques during the class. None of these techniques of the Shoden no kata were new to us: kasumi dori, dô gaeshi, karame dori, kyoto, katamune dori, oikage dori, iki chigae, ransho, kobushi nagashi. But what was new was the way Noguchi did them using more than ever the 引力 inryoku (principle of attraction). Each technique was done in such a way that uke was “sucked into” the worst possible situation. Every action he was taking was leading him into a trap. This concept of inryoku together with the concepts of 重力 jûryoku (gravity) and 磁力 jiryoku (magnetism) are three keys to understand the Gyokko ryû Kosshijutsu and were taught extensively back in 2001 during the Gyokko Ryû year. But is is one thing to discover some concepts one day and to see their evolution 12 years later. And this is exactly what we witnessed tonight. The way Noguchi sensei is trapping his opponent is simply amazing. As usual there is no hits, no inflicted pain. Uke is down not by using strong movements but by creating the illusion of these strong movements. Uke reacts to the pain he “feels” is coming and the consecutive tensions create a kûkan in which he falls every time. From the outside it looks that uke is swallowed into a black hole. This inryoku turns any movement into a death trap for uke. Noguchi sensei by alternating the fake tensions with a total relaxed body attitude, creates a situation where uke does not understand what is happening and rushes into the trap. To be able to attract uke is not easy at first, but after many years of repeating these movements with him, one becomes capable of expressing it. This is real 虚実 kyojitsu, alternating falsehood and truth and the essence of Hatsumi sensei’s ninpô. Attraction is created by moving the body lightly at a slow speed that cannot be perceived in time by uke’s brain and by emitting fake intentions so strong that uke cannot avoid to react to them. This is the practical application of proprioception* as defined by scientists. But Noguchi sensei is not only using attraction in Budô. He is a shining and attractive human being full of joy and light. Attending his classes is the best remedy I know to feel better when life is tough. Thank you sensei for your magnetism and for sharing with us your budô vision. My first class at the Honbu with Soke. 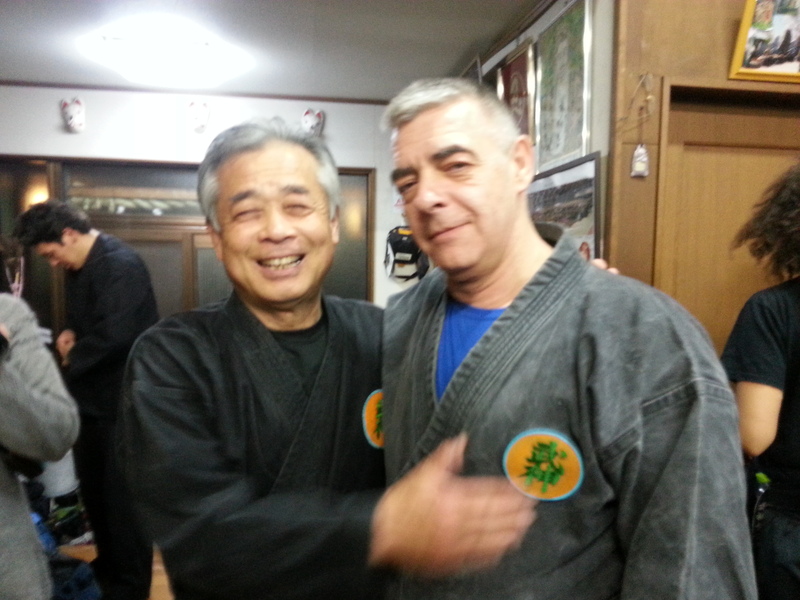 I trained in a Group of 3 with Noguchi and Senno Shihan. I don’t remember anything except the feeling. They just seemed help me to defeat myself.